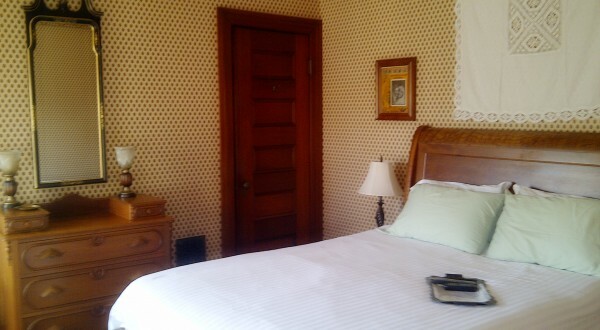 Ceilan’s Room has a Queen Cherry Sleigh Bed with a memory foam mattress, lighted makeup mirror and hair dryer. The large cherry trimmed room has a beautiful bay window facing east with a walk in closet. Private bath has an antique claw foot soaking tub with shower. This room is equipped with a desk, Wi-Fi, TV and DVD player which makes this room a convenient work-night retreat.